Emergency vehicles are essential in keeping our communities safe, which is why we always give way to them on the roads. But when you are driving on the road, it can sometimes be difficult to know what actions you should take when you see those flashing lights in your rear-view. For the past few months, we have been detailing the best ways to stay safe and share the road with trucks, bicycles, and motorcycles. So for the next in our series, here are some tips for driving safely around emergency vehicles. The most important thing to remember when you hear sirens or see flashing lights in your rearview mirror is to not panic or make and knee-jerk decisions. You do not want to create a worse situation or another accident. Do not immediately pull over without first carefully checking that there is no one next to or behind you–especially look out for cyclists and pedestrians. Check your mirrors, slow down, and pull over safely. Avoid slamming on your breaks, even if you are worried about getting a ticket. Remain at the side of the road until the emergency vehicle has passed. Always check that the coast is clear before you pull back onto the road. Do not attempt to follow the emergency vehicle through the traffic, as this will no doubt result in a fine or worse. It is recommended that vehicles stay at least 500 feet behind any moving emergency vehicle that is flashing its lights or sounding a siren. Sometimes you are driving, and you see lights up ahead. In this situation, many of the same rules apply. Give the emergency vehicle plenty of space. Some states have laws regarding whether or not you need to vacate the closest lane in order to give a wider berth to the emergency vehicle, but regardless you should aim to do so if it is safe. Slow to at least 20 mph less than the speed limit, if the limit is over 25 mph. If the speed limit is less than 25 mph, do not go more than 5 mph. A good thing to remember when driving around emergency vehicles is that you must always yield right of way. 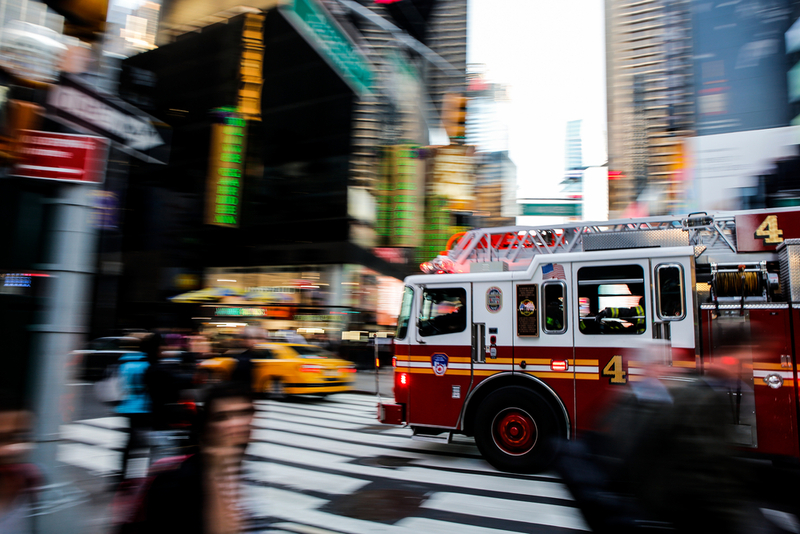 Emergency vehicles that are using their sirens are usually on their way to save a life or prevent a crime, and as such time, is of the essence. This means that they will not necessarily obey all traffic laws as they drive. For example, if you are at an intersection and your light turns green, but you see an ambulance approaching from the opposite direction, or from the left or the right. Remain where you are until they pass safely. Sometimes an accident can become dangerous to other drivers, especially when people are going freeway speeds. To prevent pile-ups, sometimes police cars or highway patrol vehicles will carry out slow down maneuvers. This will often involve a car weaving back and forth across all of the lanes. While this is fairly rare, it is important to be aware of it, so that you know to simply follow slowly behind the emergency vehicle. For more driving tips, as well as car news and interesting facts, check us out on Facebook or Twitter.